The epitome of delicious- this takes the traditional taste of chicken alfredo and gives it a healthy twist so that you can have room for everything else! Step 1. In a large skillet over medium heat combine chicken, 2 tablespoons butter, 2 cloves garlic, and Italian seasoning. Cook until chicken is no longer pink inside. Remove from skillet and set aside. Step 2. Bring a large pot of lightly salted water to a boil. Add pasta and cook for 8 to 10 minutes or until soft; drain. Step 3. Meanwhile, melt 4 tablespoons butter in the skillet. Saute onion, 2 cloves garlic, and mushrooms until onions are transparent. Stir in flour, salt and pepper; cook for 2 minutes. Slowly add the milk and the half-and-half, stirring until smooth and creamy. Stir in Parmesan and Colby-Monterey Jack cheeses until is melted. Stir in chicken mixture, tomatoes and sour cream. 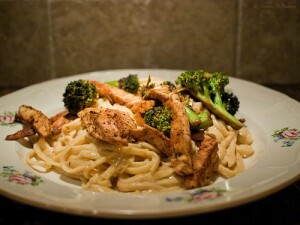 Serve over cooked fettuccine. This holiday soup brings the sweetness of butternut squash with the tartness of apple together in a perfect fusion of harvest flavor! An excellent holiday treat! Step 1. Melt butter in a large pot over medium heat. Stir in leeks and onions, and cook until the onion softens and turns translucent, about 5 minutes. Add potato, squash, carrots, apple, and chicken stock. Bring to a boil then reduce heat to medium-low, then cover and simmer until the vegetables are soft, about 20 minutes. Step 2. Carefully puree the soup in batches in a blender, or use a stick blender to puree the soup right in the pot. Once the soup has been pureed, return it to the pot and stir in wine and cream. Season with nutmeg, salt, and pepper; simmer gently for 5 minutes. Ladle into bowls and garnish with chopped chives. You’ll get everything you love in a baked potato and more with this warm, tasty casserole! It’s quick, super simple, and an instant hit with holiday crowds and get-togethers! Step 1. Combine all ingredients except Cheddar cheese and bacon in a large mixing bowl. Step 2. Beat at medium high speed with an electric mixer until smooth. Spoon into a lightly greased 13″x9″ baking pan; top with Cheddar cheese and bacon. Bring out the giddy little kid in everyone with these crowd-pleasing cookies! Step 1. Adjust oven rack to middle position and preheat oven to 350 degrees. Line 2 large rimmed baking sheets with parchment paper. Whisk flour, baking soda, baking powder, and salt together in medium bowl. Set aside. Step 2. Place 1½ cups sugar and cream cheese in large bowl. Place remaining 1/3 cup sugar in shallow baking dish or pie plate and set aside. Pour warm butter over sugar and cream cheese and whisk to combine (some small lumps of cream cheese will remain but will smooth out later). Whisk in oil. Add egg, milk, and vanilla; continue to whisk until smooth. Add flour mixture and mix with rubber spatula until dough becomes soft and consistent. Step 3. Divide dough into 24 equal pieces, about 2 tablespoons each. Using your hands, roll dough into balls. Working in batches, roll balls in reserved sugar to coat and evenly space on prepared baking sheet, 12 dough balls per sheet. Using the bottom of a drinking glass, flatten dough balls until 2 inches in diameter. Sprinkle tops evenly with 4 teaspoons of sugar remaining in shallow dish (2 teaspoons per tray), discarding any remaining sugar. Step 4. Bake 1 tray at a time until edges are set and just beginning to brown for 11 to 13 minutes, rotating tray after 7 minutes. Cool cookies on baking sheets 5 minutes. Using wide metal spatula, transfer cookies to wire rack and cool to room temperature.